Yes, heroin can be detected on drug tests. Learn about heroin drug testing, types of tests, detection times, and how heroin test results are verified. More here. Yes, heroin does show up on drug tests. When you take heroin, the effects may last from few minutes to several hours, but the drug can stay in your system for much longer than many users expect. How is heroin detected, and what steps should you take in case you have a positive drug test for heroin? Find the answers to these questions and more in the following article. At the end, we welcome your questions or personal experiences about heroin drug testing. In fact, we try to respond to all questions personally and promptly. Why order a drug test for heroin? 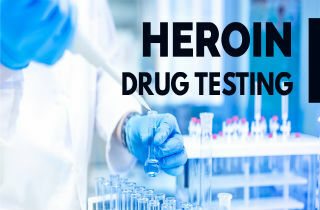 Workplace heroin testing programs are designed to detect the presence of heroin. Drug testing is a method of prevention and a deterrent from illicit drug abuse, which is why it is often part of a comprehensive drug-free workplace program. Why do employers drug test? First, heroin is responsible for a substantial loss in employee productivity. Naturally, employers and want to know what is affecting your work performance. Testing for heroin is a way to identify possible signs of heroin addiction. Further, drug testing aims to prevent employees from coming to work incapable of performing their work-tasks in a safe and responsible manner. In some organizations. drug testing is required for all employees. In fact, both federal and non-federal workplaces are allowed by law to have drug testing programs in place. Still, any workplace drug-testing program should comply with applicable local, state, and federal laws. Compliance with federal regulations, insurance carrier requirements, and/or with customers . Compliance with reinforcing the organization’s “no drug use” position . Identification of employees with substance use disorders and referring them for assistance . Establishing boundaries and rules for discipline or firing . Hair follicle testing is an effective way to detect heroin after many months since last use. Many drugs, especially heroin, remain in the hair for up to three (3) months, or longer (depending on the length of hair sample). Heroin is detectable on a urine drug test from several hours after use up to 2-4 days after use. Heavy users can fail a drug urine test for as long as seven (7) days after using heroin. Blood tests are another way to detect heroin drug use, but are considered to be the least reliable . Many opiates, like heroin, leave a person’s blood stream within 6 hours of dosing and are difficult to detect within this short window of time. Heroin has a short detection time when using saliva or oral fluid drug tests. After taking heroin, the averge detection period ranges from 5 to 48 hours. Heroin stays in the body for a short period of time. It’s half-life is somewhere around 10 minutes, and it’s out of the the user’s system within 3-4 days. However, heroin may still be detected in the user’s body even after this period via drug test. The detection window for heroin greatly depends on the type of drug test. Blood testing usually only detects use of heroin for up to 1 DAY after use. Urine tests can detect traces of heroin from 1 – 4 DAYS after use. Hair follicle tests may detect levels of heroin for up to 90 DAYS or longer. Different types of drug tests have different cut-off levels which vary by drug. A heroin cut-off should be optimized to detect the presence of the drug in any biospecimen or sample, but should also minimize the number of false positive results by being too sensitive. Here are some basic guidelines for heroin cut of levels for urine and hair screens. 1. Urine cut-off levels: The cut-off level for initial urine tests for heroin is 2000 ng/m. 2. Hair cut-off levels: The standard hair screen takes 1.5 inches of growth as a sample for testing. The detection period of 1.5 inches hair sample is approximately 90 days. If the persons hair is shorter than 1.5 inches, this detection period will be shorter as well. NOTE: A negative test result doesn’t always mean the person has not used heroin or that s/he is drug free. In some cases, the drug may be present in the body with a concentration lower that the defined cut-off. Ask if you can retake the test. Require the laboratory to retest your sample again. You can ask for a hair drug testing sample to be performed (usually you have to cover the costs). Laboratories have the highest credibility when it comes to confirmation of urine samples for drug testing. Positive test results that indicate the presence of heroin might have to be double checked because of certain foods, food supplements, beverages, or medicines that may affect the testing results. Do you still have questions regarding drug testing for heroin? Please share your questions and comments in the section below. We are interested in hearing from you and will do our best to respond to all legitimate enquiries with a personal and prompt response. Reference Sources: NIH: What are the long-term effects of heroin use? Was tested, after they told me my samole was not enough to test. After i got Insurance, and would no longer pay them $150.00 a month per visit. And right after i asked to see another Dr. the Dr. came in the room. I told him my brother was sick and was dying. He then told me the Dea contacted him. To tell him i am usi g herion. Well that is just not true. So i adked him how could that be. He gives me morphine sulfate, fenttora. Said i need to fi d another Dr. got up and walked out of the room. I saud wait a min. Can i have at least 800 mg of ibuprofen . I asked for the number so i could clear this up! He said look it up. I then ask to see the report. He only would show me the line where it said herion.not giving me a copy. I ask for the labs number. The asst . Said she had it home. This all sounds a bit made uo to my hustand myself. Ols advise! What does heroin show up as on a drug test. If I am prescribed hydrocodone 7.5/325 and was given IV morphine, and also prescribed oxycodone from the hospital, will they be able to tell that I have also used heroin separately? Please help I have a test this morning with Pain Management. Hi, Amanda. Heroin shows up as heroin on a drug test. I have been clean 75 days and just took a hair folical drug test for 90 days and cut my hair right before the drug test to 1 inch. Her ion and meth were what I was doing will I be clean on the test? Hi Troy. Both heroin and meth can be detected on hair follicle test up to 3 months. My probation officer said I had a dirty urine for heroin on May 9th. I used on April 25th over 2 weeks. I told him to retest it what will my results show. After about 16 to 18 days have passed how could it still show dirty for heroin? Hi Randy. The detection window is longer for chronic and/or binge users. Hi Nancy. Meth and ecstasy are two different substances, so on a drug test they will show up as different things. I used heroin on Sunday evening. I did a .3 i have been usi g once a week for past month. I have to urine test at my methadone clinic tomorrow friday morning. Will the heroin i did sunday show up still? Hi Angel. Heroin is detectable on a urine drug test from several hours after use up to 2-4 days after use. However, heavy and/or binge use can make this detection window longer. Hi Shay. Try to remember what have you eaten or taken. Sometimes, poppy seeds added to cakes, bagels, and other pastries, can contain traces of opiates and cause a false positive opiates for as long as two days after consumption. I suggest that you retake the test. Hi. I’m pregnant and used heroin once already that my OB was aware of. I stopped for almost 100 days but slipped aND started shooting again (2-3 bags a day for the last month). However I just stopped. If I’m 31 weeks pregnant and I don’t touch it again will my baby still test positive? I know they can test the baby’s urine, meconium or placenta..also I am prescribed fiorocet which I was told has codeine in it..I’m wondering if they do test the baby will they be able to tell I was doing heroin again or will it just come up as opiates? Swim tested positive for fentanyl and morphine but also heroin. How does the lab differentiate from the 3? Is it possible to contest the results? The test was performed on an autopsy and the cops tried to make it look like an overdose. However I know it wasn’t. What are normal levels for a heavy user? I just yesterday was informed by a drug testing facility that a hair folicle drug test performed on me tested positive for heroin. However, I am not a user and have spent every moment since then trying to figure out how traces/ dose of this drug has been detected in my system. After much thought I think the answer lies in passive exposure. Recently I moved in with a uncle with whom is battling addiction to this drug. Anyhow as he and I share a bathroom I came to notice about two weeks ago a bottle of vitamins in his medicine cabinet called testo boost. Curious about this vitamin I took one single pill and thought nothing of it. Fast forward to yesterday I learned from him that that medicine bottle, which had that single vitamin has been used by him to mix heroin. This now I believe explains my exposure. So I guess my two questions are this 1: would the hair folicle test have indicated that it was a very level of dosage? 2: would it indicate that it the level of this drug was so minimal that there is no evidence of patterned of usage? Hi Lloyd. 1. The hair follicle drug test can detect the drug up to 3 months after use, and the level of dosage. 2. The pattern of previous past use can not be determined with a drug test. Does shooting heroin or meth into ur blood stream show up on urine test. Hi Chequlla. Yes. Heroin or meth show up on urine drug test no matter the mode of administration. I took I urine test for CPS and they said I was positive for herion. The test results said herion 90 ng as the level. I am on methadone but I did not do herion. I know the test was wrong. Is 90 ng even high enough of a level to be considered a positive for herion…..I got screwed. I did a hair follicle test to prove I didn’t do herion and wat do ya know, no herion I. My hair…. I’ve been a snorter of mainly benzodiazepines for years & lost my sense of smell. Will I ever b able to smell again???? Can the urine test for herion . Tell if it from a male or female urine??? I have custody of a little boy. The state took him from his father. They did a hair folicle test on the baby. He came up positive for heroin. How much heroin has to be in your system for it to show up in a hair test? If I have been using heroin and I was taking Percocet for pain and the pain got so bad I used heroin and I need to take a drug test for my doctor is it going to show the difference between the Percocet and the heroin and if so what can I take that will mask the heroin on my drug test will they show the same? Hi Jennifer. You can check out your local Walgreens aisles for at-home drug tests. There are many varieties that test for a number of drugs and range in price from $15 to $80. Check out the link here: https://www.walgreens.com/store/c/drug-tests/ID=361307-tier3. Still the best, and most reliable test results can be acquired through laboratory drug testing. Hi Briana. Depends on the test. They don’t usually come to be heroin-specific, but can test for opiates only. In that case, any opiate drugs including heroin, morphine, opium, smack…will come up. Ok I know my boyfriend is a meth user but i know hes been using heroin and has been for 2 years now! He has all the symptoms eyes rolling behind head nodding out itching runny nose track marks ect… ive also found the crumbles of heroin all over my house and other types of heroin paraphenilla . ive drug tested him twice and all that shows up is marijuana meth cocaine and msds !!! Wtf?? Ive been educating my self on heroin addiction for two yrs now! Whay am i missing is the heroin synthetic why isnt it showing up??? Help please! My friend tested positive for heroin and negative for marijuana. She has never done heroin, but does smoke pot. How is this possible? If I passed 2instant drug test then when it went to lab & they said there was morphine & I only used alittle the day before wouldn’t my level of morphine have to be very low? My husband’s urine was sent to the lab to confirm the opiates in his body were actually Morphine Sulfate. This was through probation. However, he is using heroin. He at the time was an IV user with a relatively slow metabolism. Will the immunessay lab detect morphine sulfate or heroin? Hi Devon. Depends of the test. It may show both. Hi. I am looking for a saliva test for home use that will distinguish between heroin and methadone. The only ones I can find come in bulk for businesses at over $200. I need just a few and more inexpensive. Cannot find one anywhere that distinguished the two drugs. Help would be appreciated. Thanks! What color does the dipstick turn from inserting into heroin bag? Hi Lisa. Did you carefully read the instructions? It should be written there. First off I haven’t used in 2months , and before hand all I ever did was snort them, I have never used a needle, anyhow I haven’t used in 2 months but I did snort 4-5 lines Thursday and fri I popped a couple adderall and i have to take a urine test Monday, will it show up in my urine if I drink alot of water? So if heroin doesn’t show up but there’s a ton of morphine that shows up and you know that someone has used? Is there a way to tell how much was consumed by the amount of morphine found in their system? I’m on a pain contract. my urine test came back positive for my pain meds but also heroin. they are gonna send it off for further testing. what should I expect? and is there anything else that would trigger that to be positive for heroin other than heroin? Hi M Lewis. You can buy at-home drug test kits online. There are many companies who sell and deliver them. Otherwise, you can ask your doctor for a drug test to be performed in a laboratory. Hi mrm42. You speak the truth! But, laws and politics don’t seem to work this way. We have the example of Portugal, where the personal use and possession of all illicit drugs was decriminalized back in 2001. This drug policy has been cited as proof that softening drug laws does not increase illicit drug use or the consequences of drug use.